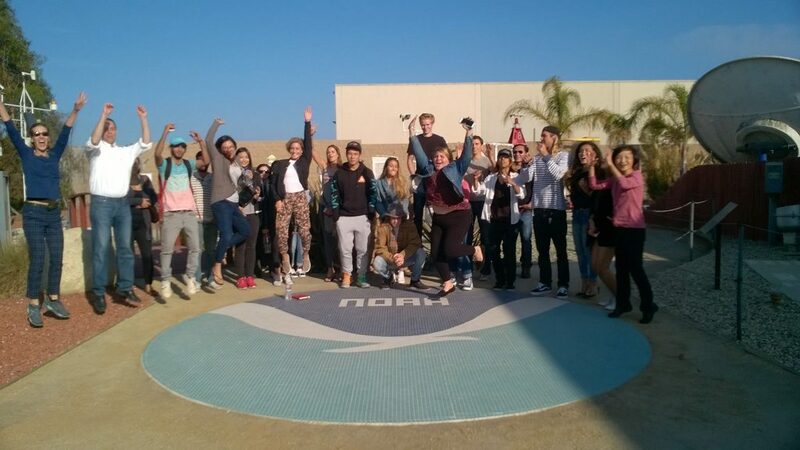 Interested geography students, Geography Professors Jing Liu and Joan Hackeling, and a weather-loving geologist, Professor Christyanne Melendez, toured the National Weather Service Forecasting office for Los Angeles and Oxnard on Friday, October 14, 2016. Aside from a gorgeous drive up the Pacific Crest Highway (where the geology was hard to ignore), the trip included a tour of the National Weather Service Forecasting office led by Dave Gomberg, the lead forecaster at NOAA. Dave walked us (literally) through the complexities of forecasting the dynamic LA weather and introduced us to relevant data and instrumentation. Professor Liu, coordinated this event to afford her students the opportunity to see how concepts discussed in class are applied in the real world and specifically in our community. The tour accomplished that and more, inspiring such excitement that prior to leaving the office we shared one giant jump for joy (pictured above). The experience didn’t stop with the tour as interested students may choose to shadow NOAA scientists, such as Dave Gomberg, during forecasting shifts, even those related to impending fire weather. Interested students should contact Professor Liu for more information about this opportunity and professional career paths in Geography.